Most people have had the experience of driving and arriving at a destination without remembering the trip. Much of human thinking and behavior is unconscious, essentially on “automatic pilot.” Expert marketers, politicians, and stage magicians are known for how they use unconscious “default” behavior to exert influence in what people think, perceive, and choose. Savvy leaders do well to adopt the same influence tools. There can indeed be a fine line between manipulating and tricking people on the one hand, and nudging and influencing with integrity and transparency on the other. But as Thaler and Sunstein note in their book, Nudge, rarely is there a “neutral” option in choices and decisions. Leaders will invariably find themselves to be choice architects, influencing others whether they want to or not. 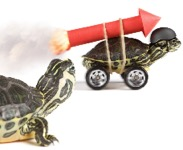 Organizations and individuals alike are constantly implored to develop a competitive advantage. Paradoxically, what may give you a real edge is a well-honed capacity to collaborate. In an increasingly complex world, leaders are more likely to face the challenge of collaborative projects and partnerships - efforts that will require different professions or different organizations to work together, including endeavors that span business, nonprofit, and public sectors. There is hardly a better competitive advantage than being comfortable and effective in working across boundaries to achieve mutually beneficial results. Collaboration is not for the faint of heart. The following outlines seven essential ingredients leaders should include to assure success in collaborative projects. Your network is the sum of connections you have with other people that might be used to share benefits. Networking is the intentional actions you take to build your network. Networking is a lifelong endeavor, likely to play a vital role in making the achievements you desire a reality. There is no time like the present to take the initiative, and begin networking wisely. This session outlines seven fundamental principles of successful networking for long-term value. Effective leaders develop agility in understanding themselves, interacting with others, and managing their life endeavors by intentional development and application of specific modes of thinking. This coaching session outlines seven modes of thinking that are of particular importance to leaders. If you truly are driven by escaping mediocrity and accelerating achievement, you have to resist what most people do, which is focus on weaknesses. Most people have been introduced to the idea that they should emphasize building on their strengths. Even so, Individuals and companies alike still persist in approaching development and performance management by identifying relative weaknesses and then trying to shore them up. The trouble is, if you do everything generally well, you will probably avoid failing but certainly fail to achieve excellence. 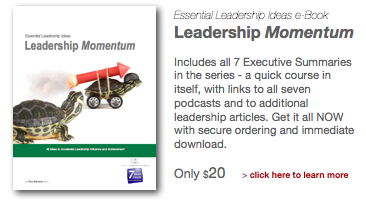 This session offers seven ideas to focus on strengths as a way to generate Leadership Momentum. Credibility generates an assumption of capacity to accomplish objectives. Moreover, credibility generates trust, and trust automatically gains a leader the benefit of the doubt. People carry on with their efforts, look beyond mistakes, and work around annoyances and inconveniences. Savvy leaders know that multiple credibility indicators are more compelling than any single credential or quality. The seven assets and qualities discussed in this session are not exhaustive, but certainly among the most likely to broadly gain leaders credibility.